DIN Standards are issued for a variety of components including industrial fasteners as DIN 438 Slotted Set Screws with Cup Point. DIN 438 Screws are manufactured from Austenitic stainless steel A2 and A4, Brass, Alloy Steel, Carbon Steel and with Zinc Plated. DIN 438 Screws are available in a wide range of sizes, shapes and materials. 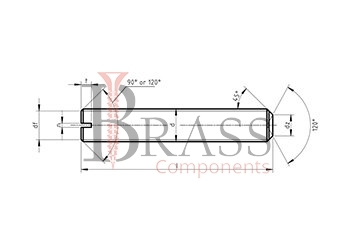 DIN 438 Set Screw with a metric single threaded of Accuracy Class C, Cut along the entire length. The torque of DIN 438 Screws is transmitted using a universal flat screwdriver through a straight slot. The constructive feature of DIN 438 Screw is a cone drilled at an angle of 120 degrees, forming a sharp edge in a flat end face. DIN 438 Screws are installed in a blind hole and tightened so that the base metal is squeezed out by edge. Special Projections and Grooves are provided at the end of DIN 438 Screws to create a more secure attachment. DIN 438 Screws are complying with GOST 1477-75 and ISO 7436. 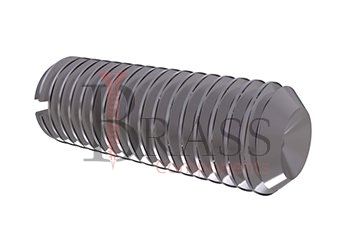 Due to Frictional forces, Self-Locking of hardware in the hole of DIN 438 Screw occurs. DIN 438 Screws are available with galvanized coating to increase the service life. DIN 438 Screws are sufficient to provide mechanical properties at the level of strength class 14H. Range of DIN 438 Screws are available with a convenient design, special shape and very convenient for fixing fastened products. Standard GOST 1477-75 allows the use of such coatings for DIN 438 Screws as zinc chromate, nickel, oxide and phosphate. If the use in corrosive environments required, it is advisable to use mounting DIN 438 screws made of stainless steel materials of type A2 and A4. DIN 438 Screws are used in the nodes that perceive alternating and vibration loads. General Range of DIN 438 Screws are used in Machine Building, Instrument Making and other industrial and manufacturing industries. DIN 438 Screws are widely used to secure reliable fixation of products relative to each other. We manufacture DIN 438 Screws as per Custom Specification and export in France, Italy, Switzerland, Poland, Greece, UK and other European Countries. For more Information, Please Contact Us or Inquiry Now.